I was really looking forward to race the Royal 162 because that gave me the chance to see so many people who I met at Trans Iowa. It’s like a re-union of sorts. In fact that is why I love gravel racing – the community creates such a laid-back but still competitive atmosphere. Chris Skogen, the race promoter, is the incarnation of the gravel racing spirit. His race was a perfect example what gravel racing is all about. “Be nice and enjoy the ride.” That was his mantra for this race. At 7 am between 30-70 racers congregated on the main street in Spring Valley, Minnesota. As a warm-up we sang Happy Birthday to Chris’s son. And then off we were for a challenging 162 miles. We had our cue sheets all printed out so we knew the course. The question remained…would I use them? Easy peasy tempo the first 20 or so miles chatting it up through the first few rollers. But I always had an eye on my chosen wheel to follow. Early in the race I give all racers a secret ranking from stay-the-heck-out-of-that-draft to potential-wheel-sucking-opportunity to start-appreciating-the-racer’s-sweat-odor-now…. I found my chosen wheel. Not even 20 miles into the race and a creek crossing later it was only four of us. I was concerned! But first and second ranked wheel were right here so it was all good. Approaching the first potential stop to refill water, wheel 1 wanted to stop, but wheel 2 wanted to keep going because his bike was decorated with water bottles on every possible spot. I was jealous! I had to stop. No cinnamon rolls today. My engine was still running on the apple pie from the night before. We left the gas station and wheel 1, a.k.a. Dominic, chased and passed everything that could be of any potential threat. And when there was no threat anymore he just rode a leisurely pace which made me burn through my apple pie storage so quickly that I wished I had eaten two the night before. 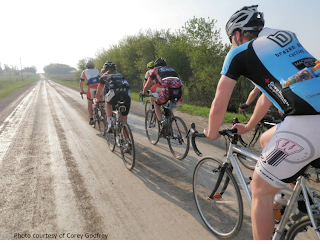 When we re-entered the Almanzo course, Dominic found new motivation to speed up. We had been averaging 17.6 mph for the past 120 miles. My fuel light had been panic flashing at me for the past 20 miles. Finally, the German engine had to succumb. Okay. New situation for me. I had a choice. Wait for wheel 2, somewhere behind me. Or, try to stay away for 40 miles? Let’s play the game and stay away. Now, I had a chance to see more than rubber. Wow, what a scenic race! Volunteers and spectators were cheering. Everyone was embracing the spirit of the race. Be nice and enjoy the ride! It was sunny, the temps lingering somewhere in the 70s. A light breeze coming from the finish line. This cant get any better! What a great race! Snap out of it! No dreaming, Monika! Oh yea….where were my cue sheets again? Which mileage are we on? 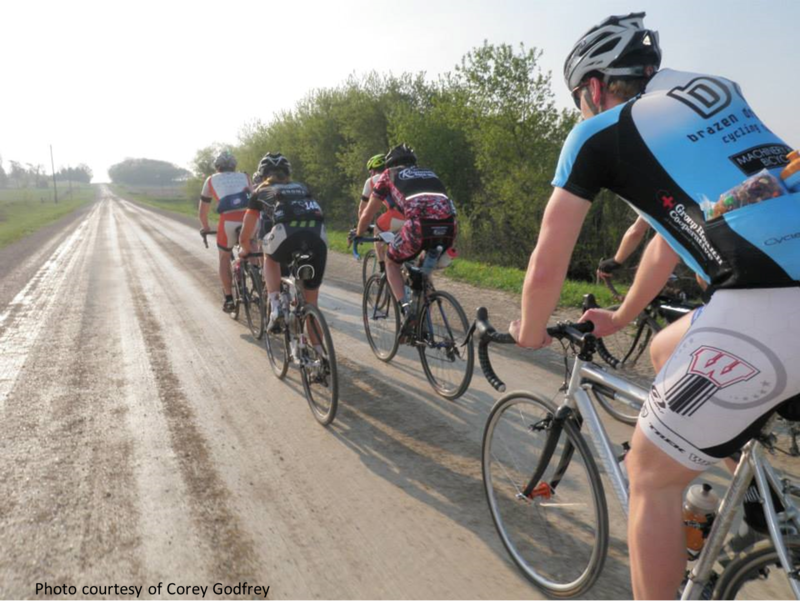 Ahh…all the Almanzo racers around me would know the course. I am fine. Well, not so fine as I found out at mile 145 when I got lost. Wheel 2, a.k.a. Jim, caught up with me. We were both lost. A dead end turn-around, a phone call, 4 miles and 20 minutes later, we were back on course. It was a little unsettling. How many Royal racers would have passed us? While Jim and I rode side by side I was still fishing for my second to last cue sheet somewhere in my jersey pocket. No cue sheet to be found. So while getting dropped at that beastly hill at mile 155 or so, I asked for directions by Almanzo racers to the cheering finish line. People lingered in the grass enjoying cold beer and sharing stories about the day. What a great event! Thank you to Chris Skogen, the volunteers, and all the racers for such a spectacular time! Nice post Monika! I'll see you at the DK and at Worlds.